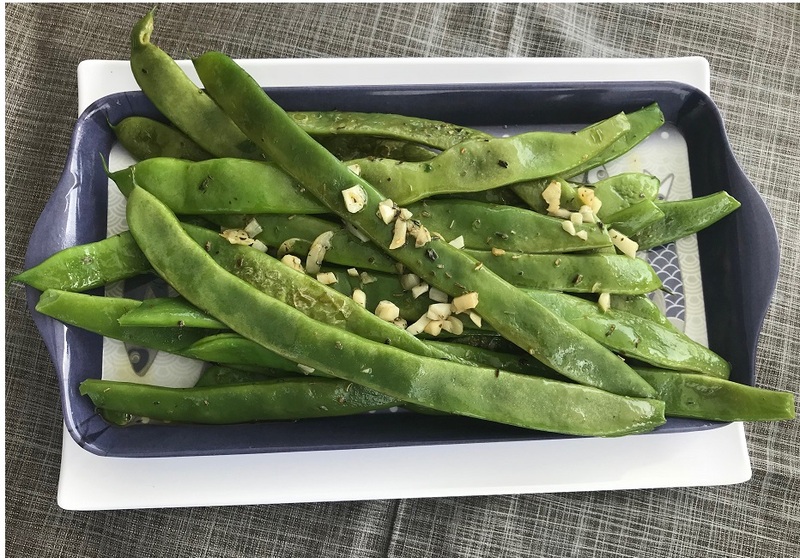 While traveling this summer in Spain and Portugal, fava beans were one of the most common vegetables we encountered in local markets, and they were often featured as a side dish in restaurants. Fava beans (also called faba beans or broad beans), are super large green beans, and they are loaded with nutrients, including: vitamin K, vitamin B6, zinc, selenium, magnesium, folate, and of course fiber. They are also a very good source of lean protein. You could shell and discard the pod and just eat the inner beans, but far more traditional is to cook the whole bean, similar to serving whole French green beans. Many people notice that they are tough when only sautéed. The trick is steaming or boiling them for a few minutes, before they are sautéed, making them tender and delicious, just be sure to avoid overcooking them. Remove stems from fava beans. Add to briskly boiling water for 4-5 minutes, until beans become fairly tender but still very al dente, then soak in cold water for 1 minute, drain, and set aside. Heat a large sauté pan to medium heat, add olive oil, then red onion with salt and sauté for 2-3 minutes, stirring occasionally, until onion starts to soften. Stir in fava beans, cover, and sauté with an occasional stir for another 2-3 minutes until fava beans are tender and still al dente. Reduce heat to a simmer, stir in garlic and basil and cook about 1 additional minute. (Avoid overcooking until the beans are soft, as they lose their flavor and texture.) Serve immediately.